Far be it from me to make fun of another’s mistakes. Let he who is without sin, right? But when that certain someone is a 24-hour sports network which fell asleep at the wheel after an important Sunday night game, then why not? I may be leaving myself open to ridicule for my next syntax error (probably within this very post) but immediately after the Giants-Eagles game, ESPN went live to Andy Reid’s press conference. Reid is the head coach of the Philadelphia Eagles… but according to those at ESPN, Reid is one of their wide receivers (see below). The incorrect super stayed on screen for about two minutes, long enough for me to snap this photo. I know we’ve been overexposed lately to that grainy Punt, Pass and Kick video of Reid as a disproportionately large teen, but to confuse him with an NFL wide receiver, well, let’s just say someone wasn’t paying attention. 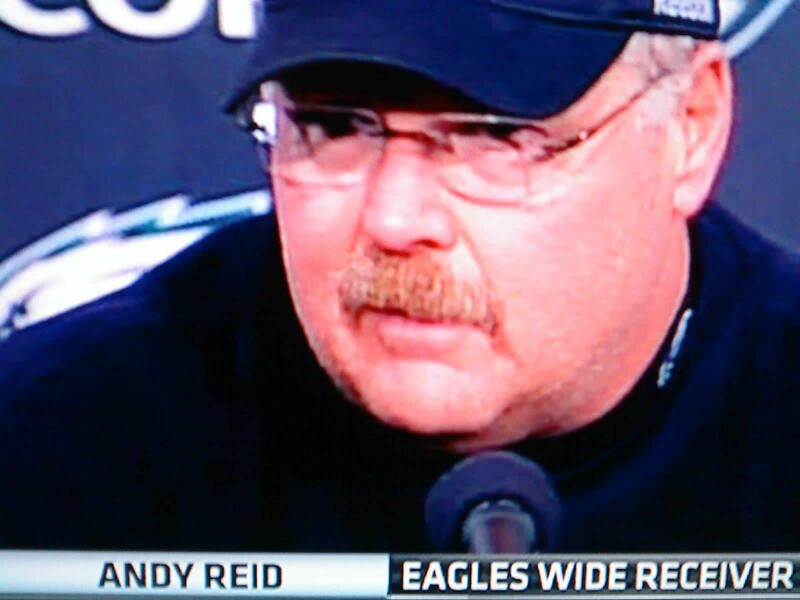 So, in celebration of human error, I present to you Andy Reid, Eagles Wide Receiver. Let’s hope they don’t overpay come contract time. This entry was posted in Featured, Pigskin, Screen and tagged Andy Reid, ESPN, New York Giants, NFC East, NFL, Philadelphia Eagles by Chris Humpherys. Bookmark the permalink. I wonder what his 40 time is. As strange as the game was, this gaffe seems almost appropriate. I say send him out there and give Jason Avant the headset, maybe he won’t drop it! Who do you think would win a race between Reid and Rex Ryan and how much would you pay to see that? What’s going on with your boys in our pick ’em pool? SportsChump’s going wire to wire. Not that that shocks you. You should have continued watching, because later in the broadcast they broke the story that he’s carrying Michael Vick’s child. He’s certainly got the stomach for it. Now I understand why they didn’t hang onto Hank Baskett! How ’bout a nickname for our boy Reid? Like ‘Hands’ or ‘TD Reid.’ Think he’d ever change his name to a number? And it’s awfully quiet over there at Doin’ Work after that Raiders loss. I think Reid could take over a Vrabel kind of role! Just when you think he’s there to do nothing he slips out for a two yard pass! Yeah man, it has been quiet lately on the blog front. Mainly, just been busy. I didn’t even really see much of the loss thankfully. At least they still haven’t lost to anyone in the division! That being said, I’m working on a Pacquiao theory right now! Well, Chap, at least Seymour got his in. And maybe that’s why Reid had McNabb shipped off. Because he wouldn’t throw him the ball. Chump, you are well positioned to finish atop the pro pickem contest, just remember the key word is “finish.” I’m also in a college pickem, where last weekend one guy went 15-0-1; I wish I’d have taken him and his picks to LV. More importantly, will you be able to snag one of the final playoff spots in our fantasy FB league? I’ll be sure to wear my head held high the next time I stumble into Joe’s and see the Steelers clan mourning their misplaced wagers. Hey, if you send me a picture of you wearing that SportsChump t-shirt, either on stage, in Vegas on your next trip, or at a traditional Gainesville mainstay, I’ll gladly put it on the site. HAHAHA! That must be why they let McNabb go! Don’t you mean IF Pacquiao and Mayweather will fight? Where’s Al when we need him? Ah the problems of being in Vick’s shadow is now rearing its ugly head. Is the same guy who ‘tweeted’ that God did him wrong in making him drop that pass in the endzone ? I’ve hear that Freddie Mitchell now wants to re-sign with the team and show the kid how things are done ? Mayweather has more pressing issues on his hands like trying to stay out of jail . If he gets sent down then he’s quite possibly looking at 20-25 years on the various charges leveled against him Clark County Nevada. I just put up a new piece where I question whether the league is ready for Vick to be its MVP. And Mayweather may eventually HAVE to fight Pacquiao just for bail money.